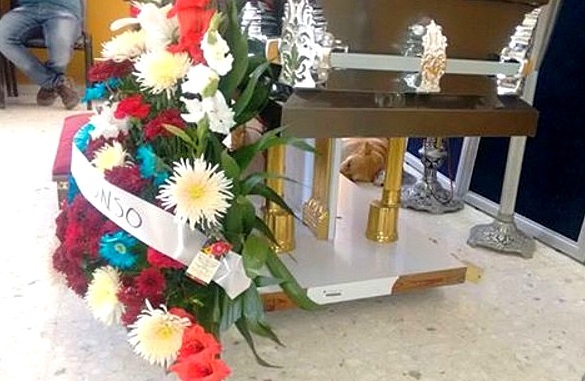 “We normally don’t let animals in, but the dog was howling and scratching at the door, so we brought him in,” a funeral parlor employee told El Sol. When Bayron’s terminally ill mom went to stay with relatives could no longer care for him, family members came to pick him up, but he had disappeared. Two weeks later she died, and though no one knew were Bayron had gotten to in the meantime, remarkably, he showed up at her funeral service to say goodbye. Doña Rosalba Quiroz, who had been fighting a losing battle against cancer, lived with Bayron on a ranch outside of Montemorelos, Mexico. Several months ago, her health declined to the point that she could no longer care for herself and went to live with relatives. Bayron stayed behind on the ranch, and Doña visited him often to make sure he had plenty of food and water. When her condition worsened and she could no longer travel, she asked family members to take over, but when they went to check on him, he had vanished. 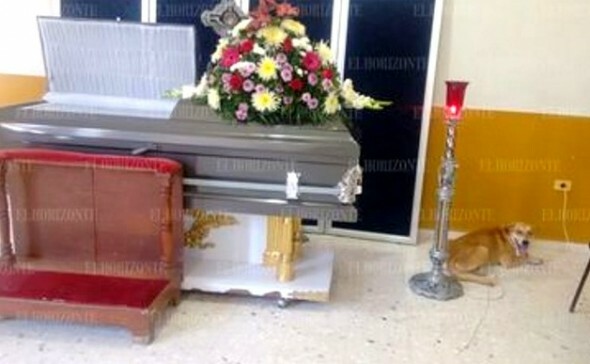 Fifteen days later, Doña sadly succumbed to her disease. 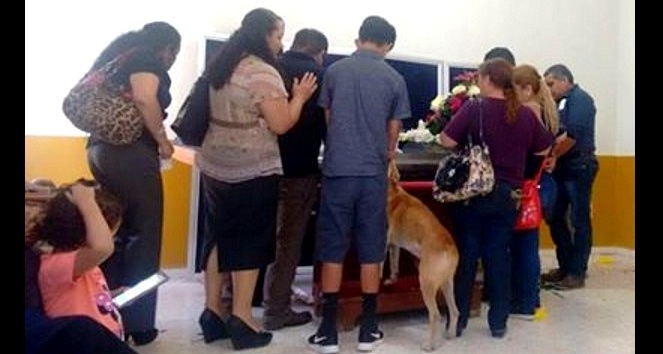 No one had seen Bayron in all that time, but he incredulously turned up at her funeral, which was held miles away from her home. 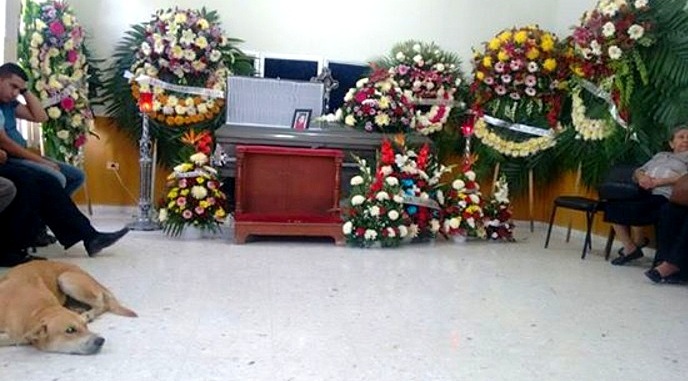 He lay near the casket, and as loved ones stood up to view Doña’s body, Bayron did the same. 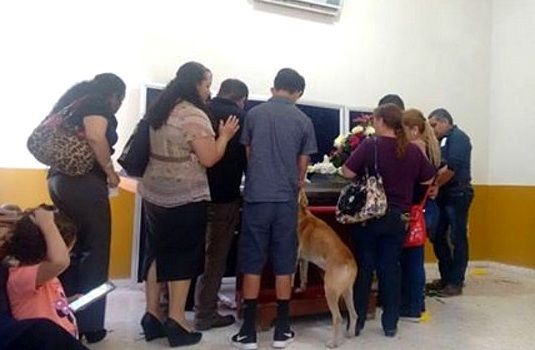 He seemed to understand that she was gone, and they were all there to say goodbye. Hopefully Doña’s relatives realize what a devoted family member Bayron is and took him in for good. This devoted dog needs a home! The reader’s here would gladly do that! Let us know, and we will be there!!! Update please! Please keep me posted on what happened to this precious dog. How could the family not want to do everything to find this dog a good home for his true example of love and loyalty? If they will not, I need to know if the dog found a good home. Yes, I would say there are many of us who want to know what happened with Bayron. He is obviously an extremely loving and devoted companion, and highly intuitive. He deserves a loving home and a life filled with joy and care. Please update everyone regarding Bayron’s current situation. What a sweet dog!